Black and white line block print on Japanese vellum depicting the levitating figure of Salome dressed in a white robe and with writhing snake-like curling black hair as she holds the severed head of John the Baptist (Jokanaan) complete with tendril-like hair and dripping blood. These drips form a puddle in the lower right hand section of the design, from which a white lily grows statuesquely. In the top left hand corner of the image is a cluster of circular black and white objects, perhaps referencing the 'clusters of black grapes' to which Salome compares John's hair. 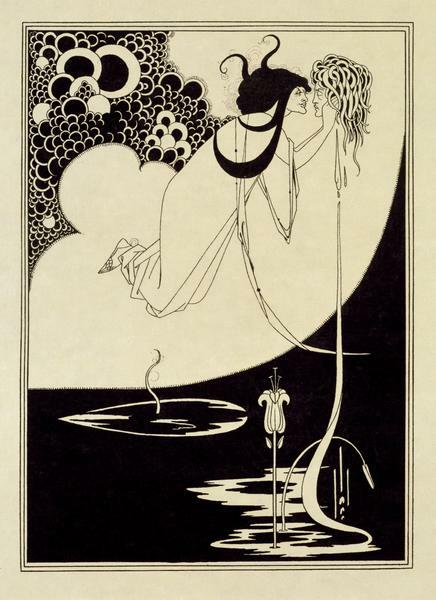 This image was based on the original version of 'The Climax' by the artist, entitled 'J'ai baisé ta bouche Iokanaan', illustration to Oscar Wilde's play 'Salome', published in 'The Studio', Vol. 1, No. 1, 1893 (E.456-1899). Printed text in the lower right hand corner of the sheet. Signed with the artist's monogram in the lower right hand corner of the image. 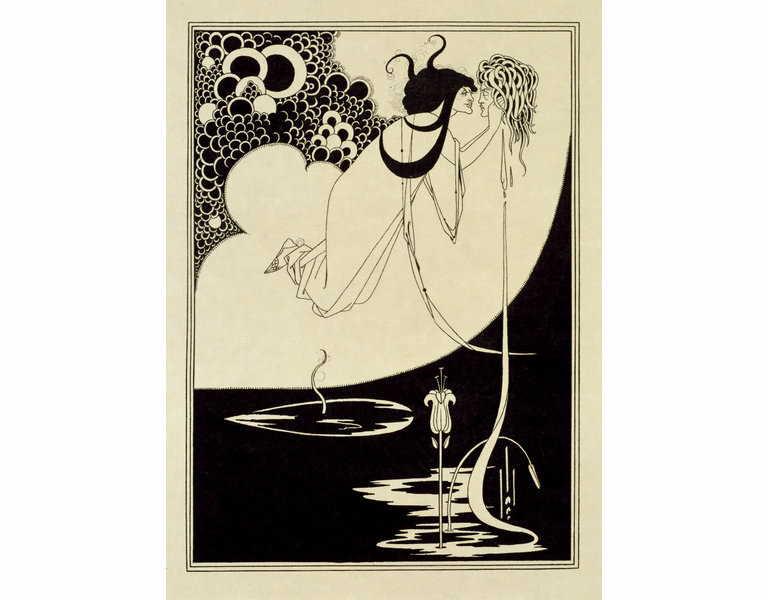 From 'A Portfolio of Aubrey Beardsley's drawings illustrating 'Salome' by Oscar Wilde'. Second issue. Published by John Lane, London . With contents sheet in letterpress and 17 plates [E.422 to 438-1972] in a portfolio of grey-green paper boards, half bound in vellum, with green silk tapes, stamped in gold with title and the rose-bush motif from the 1894 edition. With the stamp of A. Lang Buchhandlung Moskau inside the front cover. The plates are no longer in the portfolio but are now mounted separately. Guy Cogeval and Beatrice Avanzi, eds. de la Scene au Tableau Rovereto: MART - Museo di Arte Moderna e Contemporanea di Trento e Rovereto, 2009. ISBN: 978-2-0812-2944-0. Calloway, Stephen. 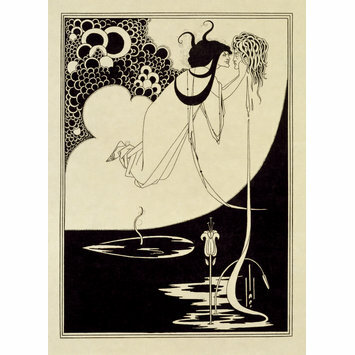 Aubrey Beardsley. London: V & A Publications, 1998. 224pp, illus. ISBN: 1851772197. First printed in 1894; this print is from the second edition, 1907.